Pursuing a long-time interest, I started backpacking 3 years ago, beginning with day-hiking and single overnights. Currently I’m mostly a ‘weekend warrior’, but managed a week long section of the Appalachian Trail (AT) last year. I hike and backpack mainly in the hills and valleys of West Virginia, but will be section hiking more of the AT this year. I’m usually a hammock sleeper, but am currently testing a Tarptent. In general my backpacking style is lightweight and minimalist, and I try to cut as muck pack weight as I can without sacrificing warmth, comfort, or safety. The Skin200 and Bodyfit260 are both part of Icebreaker's 'Skin Layer' line of thermal underwear, with the Skin200 being described as 'lightweight' and the Bodyfit260 being described as 'midweight'. The description of each on the website is consistent with the actual product. The Skin200 is a thinner lighter wool than the Bodyfit260, with the Skin200 being slightly "see through". When I hold the fabric up to the light, I can easily see through it. When I wear it, a hint of skin shows through. This top has a moderately high neck, hitting about an inch (2.5 cm) below the center of my collarbone. The neck is bound with a 3/8 in (1 cm) wide strip of fabric that appears to be slightly heavier than the material of the body of the top. The inside of the binding has a flatlock stitch, and the outside has a top and bottom row of straight stitching. A 1 x 2 in (2.5 x 5 cm) label identifying the manufacturer, model, and size, as well as proclaiming the top as "100% pure merino" is stitched into the neck. An additional small label (1/2 x 1 1/2 in or 1 x 4 cm) with the Icebreaker name protrudes from the right lower side of the top and a 1/2 x 1 1/4 in (1 x 3 cm) label proclaiming 'Skin200' is sewn to the bottom of the left sleeve. The sleeves are quite long, measuring about 25 in (64 cm) from the armpit seam to the end of the sleeve. I can easily pull the sleeves down far enough to cover all but the very tips of my fingers, or I can push them up above the elbow if I want. So far, I prefer to allow them to just loosely rest at the base of my hands. The sleeves are raglan style, with flatlock seams angling from the bottom of the armpit toward the neck. The body of the shirt hits just below my tailbone, measuring approximately 26 in (66 cm) from the neck to the hem at center back, and has gusseted side panels approximately 4 in (10 cm) wide that extend into the underside of the sleeves, tapering to a point about midway down the sleeve. Stitching on the gusseted side panels is also flatlock style. When I hold the Bodyfit260 fabric up to a light, I can barely see through it, but when I wear it, nothing shows through underneath. The Tech Top model has a high standup collar with a 9.5 in (24 cm) zippered opening. 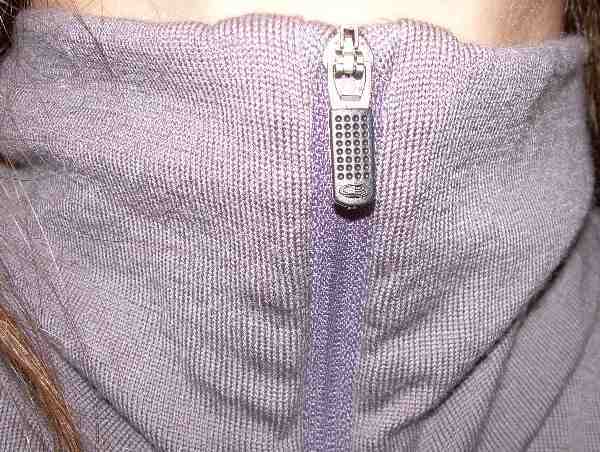 The top of the neck has small triangular gussets of fabric that cover the metal stoppers at the top of the zipper, but they do not cover the zipper pull itself. The company website states the collar can be worn three ways - unzipped, zipped up, or zipped up and rolled. I'm not a big fan of high necked garments, so I'll probably mostly be wearing the collar down, but it's nice to know there's the option of zipping it up tight in cold winter breezes. Fully zipped up, the collar stands 4.5 in (11.5 cm) high and not only covers my entire neck, but also extends partially under my chin. The Bodyfit260 has similar labels to the Skin200. 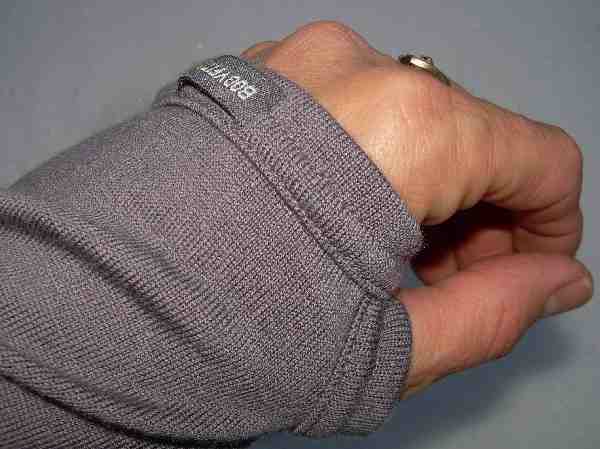 The raglan style sleeves of the Bodyfit260 are also on the longish side, but not as long as those of the Skin200, measuring approximately 22 in (56 cm) from the armpit to the hem, and feature thumb loops. These sleeves can also easily be pushed up to above my elbows. The body is constructed with side panels and has a princess style fit. A small icebreaker logo is embroidered on the left chest in a thread of similar color to the shirt body. The body measures approximately 26 in (66 cm) from the base of the neck to the hem. The Bodyfit260 seams are of serged construction. Below are photos showing details of the thumb loops and the neck. Fabric and manufacturer identification tags with laundering instructions are attached to the interior lower left side seams of both tops. Both tops are designed in New Zealand, constructed of 100% New Zealand Merino Wool, and manufactured in China. Laundering instructions are to machine wash in warm or cool water ('wash colours separately') and to line dry or dry flat in shade. They also can be warm ironed but not tumbled dry. The label warns not to use softener or bleach, and warns of up to 5% shrinkage. The label also states the tops can be dry cleaned. In addition to the instructions written in English, international laundry symbols are shown. The Skin200 came packaged in a cardboard box with a slideout tray that gives information on the style and features of the top, tells about the source of the wool, and boasts of the benefits of Icebreaker wool, such as comfort, warmth, breathability, and the way it remains 'odour free'. Care instructions and a sizing chart are also printed on the box. Both products came with hangtags designed for that particular model and giving additional overall information about the product lines, the origin of the wool, benefits of Merino wool, and care/laundering instructions. So far I am very impressed with both the Skin200 Oasis Crewe and the Bodyfit260 Tech Top. They are both very soft and supple - silkier than any other wool garment I've ever owned. The stitching all appears even and secure. The labels and tags are subtle and unobtrusive, which I like. I also like the fit - form fitting without being tight or clingy. The length and fit of the sleeves is a pleasure - they are long enough not to leave skin exposed in cold conditions, and easy to push up if I want them out of the way, and they will stay up where I push them. They are each comfortable to wear alone, and work well together. One thing I appreciated right away was the way the longer sleeves of the Oasis Crewe stayed down and in place when I slid my arms into the Tech Top. I've often had the problem of the sleeves of a base layer shirt being pushed up when I pull another long sleeved top over them, resulting in discomfort and extra bulk and the need to try to reach up under the narrow top sleeve and fish that bottom sleeve down. It's a pleasure not to have this problem using these two tops together. I wore one or the other of the tops over the weekend for casual indoor use, and used both together for a quick day hike and a fun day playing in the season's first real snow with my grandson, and was impressed with their comfort, warmth, and the fact that even after two and a half days of almost solid use they really did not have much of an odor. About the only thing I smelled on them was a slight scent of deodorant - no body odor at all. The Skin200 Oasis Crewe is light and plain enough that I can wear it layered under a button front shirt and it looks professional enough for work. I anticipate wearing it often that way through the next month or two as winter lingers on. The Bodyfit260 seems ideal as a casual shirt on it's own - nice weight and nice warmth for indoor winter use at home or under a jacket for daily activities. Together the two are very warm, so I anticipate using them together often as I play outdoors. In the last two months I've worn the Skin200 several times a week, and the Bodyfit260 once or twice most weeks. The photo above was taken near 'The Scales' on the section of the Appalachian Trail between Grayson Highlands State Park and Virginia 603. Temperatures ranged from around 50 F to 70 F (10-20 C) on this hike. One or both of the tops have been worn on many dayhikes in various areas of western and central West Virginia and Ohio, at several Girl Scout camps, on two overnight backpacking trips in western West Virginia, and for a weekend at Amicolola State Park in Georgia. Overall temperatures varied widely, from a low of around 20 F (-10 C) to highs in the mid 70 F (25 C) range. Weather included a variety of sunshine, cloudy days, rain, and snow. Terrain has ranged from the rare level stretch to the more common hilly slopes, with quite a few steep sections thrown in for good measure. On most hikes I wore the Skin200, although when temperatures were between 35-45 F (2-7 C) I usually wore the Bodyfit260 instead for a little extra warmth. 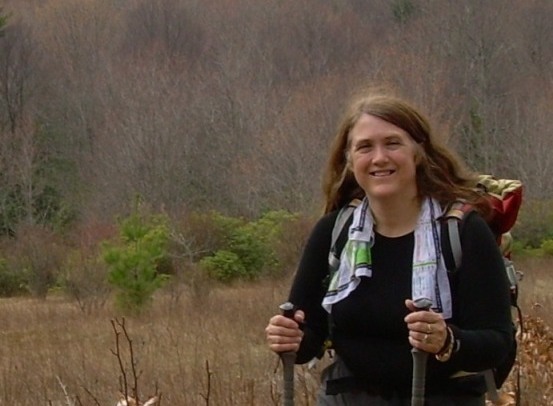 I often wore both tops when resting or setting up camp, and outdoors at Girl Scout camp. For these non-strenuous activities, I found both tops worn together were adequately warm for me down to around 40 F/5C, unless it was windy. When hiking, I was able to wear the two tops together and stay adequately warm down to about 20 F (-7 C) if there wasn't much wind. If it was very windy, I usually added either a windshirt or a waterproof/breathable rain jacket and felt comfortable at the same temperature. I also found the Skin200 and an insulated jacket worked well for hiking in windy sub-freezing weather. I wore the Bodyfit260 comfortably in temperatures as warm as 60 F (16 C), but find it too warm much over that. The Skin200 has been fairly comfortable hiking in warmer temperatures (up to around 75 F/25C) so far, although I definitely am sweating on the uphills in temperatures that warm. I've found the Skin200 and Bodyfit260 work nicely together as a system. The Bodyfit260 is easy to pull over top of the Skin200 and adds a good bit of warmth - in many cases enough so that a bulkier jacket isn't needed. The shirts stretch when I do, and have never felt confining or binding, even when worn together. Both shirts wick very well, so even if I get sweaty on the uphills, the shirts transport the moisture away from my skin and I don't freeze on the down hills or when I'm resting. One surprise has been that the shirts seem to dry pretty quickly even when they have been soaked with sweat. In the past, I've always changed out of my sweaty hiking shirts at the end of the day before retiring to my sleeping bag - partially to avoid getting moisture in my sleeping bag, and partially to avoid having to smell my stinky shirt as I tried to get to sleep. So far, I've found the Skin200 will dry out adequately enough that I feel comfortable sleeping in it after a day of hiking, and it is nearly odor free! This has been especially nice on winter backpacking trips so I don't have to change back and forth from hiking to sleeping shirts, getting chilled in the process. I'm not much of a morning person, so putting a damp cold hiking shirt on first thing in the morning is especially torturous. It's been nice to be able to leave the Skin200 on when I snuggle into my bag for the night, and wake up the next morning and just pull more layers on over top instead of changing out of a sleeping shirt. I hope this continues as the weather becomes hotter and more humid, in which case I'll probably be considering leaving my normal 'extra' sleep shirt out of my pack to shave a few more ounces. The Bodyfit260 also seems to dry fairly quickly, and although I've found it too warm for sleeping in with my current sleeping bag, I would feel very comfortable doing so if temperatures dropped lower than I anticipated. It adds instant warmth on a chilly morning when I pull it on over the Skin200. After two months use, both tops look nearly as good as new, in spite of being worn regularly and washed at least once a week (2-3 times several weeks). I have noticed a few minor 'fuzz balls' clinging to the Skin200, mostly in the underside area of the forearms, but these have been fairly easy to just brush or pull off. On a couple of warmer hikes, I've worn the sleeves of the Skin200 pushed up, and found the wrist area stayed a bit stretched out when I pulled the sleeves back down as temperatures cooled off later in the day. So far, they've regained their original nice snug fit after washing. Most of my hiking has been 'on trail' rather than bushwhacking, but a few stray green briers or multi-flora rose branches have reached out and caught at the fabric, but the tops haven't picked or developed snags or holes from these encounters. Overall, I'm very happy with the performance and quality of these tops. In April I wore the Icebreaker tops while hiking about 70 mi (113 km) of the AT in Tennessee and North Carolina. This included several 'slackpack' hikes (which are basically long dayhikes) while staying in a hostel in Erwin, Tennessee, and on an overnight backpacking trip with a stay at Curley Maple Gap Shelter. The overnight trip was approximately 9 mi (15 km) and the slackpacks ranged from 11 to 22 mi (18 to 35 km). Temperatures ranged from an overnight low of about 20 F (-7 C) on the overnight to a high of about 60 F (16 C). Elevations ranged from 1700 to 5500 ft (500 m to 1700 m), with over 12,000 ft (3700 m) of elevation gain, and a similar amount of elevation loss over the entire section. Most of the days were sunny or partially cloudy. For most of the hikes I wore the Skin200, although I did add the Bodyfit260 over it a few times when temperatures were cooler than 40 F (4 C), and used an insulated synthetic jacket in the early mornings and late evenings. I also wore the tops during a short overnight backpacking trip of about 3 mi (5 km) in southern West Virginia in late April, where the overnight low was 35 F (2 C), and the day time high was about 65 F (18 C) with no precipitation, but high humidity. I wore the Skin200 while hiking, adding the Bodyfit260 during the cooler evening hours. In mid-May I wore the tops on a rainy overnight backpacking trip in central West Virginia. The distance was short, only about 2 mi (3 km), with rain all of the way to camp and during most of the night. The low temperature was around 40 F (4 C) and the high about 70 F (21 C). The elevation ranged from 700 to 900 ft (200 to 300 m). I wore the Skin200 during the hike in, but managed to get it pretty wet in the rain while hiking and setting up camp even while wearing a rain jacket, so when I retired to my tent for the evening I changed into the Bodyfit260. In late May, I wore both the Skin200 and the Bodyfit260 as insulating layers on a 28 mi (45 km), three day backpacking trip to the Cranberry Wilderness and Backcountry in southeastern West Virginia. Temperatures ranged from overnight lows of 50 F (10 C) to highs about 75 F (25 C). Elevations varied from around 2800 to 4200 ft (850 to 1300 m). Skies were clear to partly cloudy, with only a few scattered rain drops one evening, but high humidity during the entire trip. In addition to the Icebreaker tops, I took a light windshirt, but no insulating jacket of any sort. I've found the Skin200 wonderful for hiking for temperatures below about 65 F (18 C), and great as a base layer for sleeping in cooler temperatures. It wicks sweat away from my skin well, and even when the shirt was damp with sweat I've seldom experienced a 'cool down' chill as I have with some synthetics, although when it was fully saturated with rain I did find it very chilly as temperatures dropped below 45 F (7 C). What I've appreciated most about this top is that it is virtually 'stench-free'. Unlike most synthetic shirts I've worn, which absolutely reek by the end of the day and make me want to gag by the end of a weekend, I've found the Skin200 absorbs very little odor. I've even been able to wear it to sleep in after a full day of hiking without worrying about my sleeping bag picking up odors from my shirt. I've also found it very comfortable to wear - I've experienced no itching, chafing, or binding while wearing this shirt. I did finally abandon wearing it for hiking on my last trip, due to warmer day time temperatures and knowing I would have quite a bit of elevation gain at a fairly rapid hiking pace. However, I had been so impressed with the Skin200 that I had purchased a short sleeve lightweight Icebreaker top a few weeks before this trip, and I wore that shirt while hiking. I also kept the short sleeve shirt on in the evenings, adding the Skin200 as temperatures began to drop in the evening, and then the Bodyfit260 over both tops in the later evening. On this trip I was using a light weight quilt with about 2 in (5 cm) of loft, so I also slept in the short sleeve Icebreaker top with the Skin200 over it, adding the Bodyfit260 on the first night as temperatures dropped and humidity rose. I found just the layered wool tops provided plenty of insulation for the conditions I experienced on this trip. I have to say these are the best tops I've ever owned for hiking and active pursuits, are very comfortable, and presentable enough for casual wear. The Skin200 even makes a great layering piece under other shirts or jackets for business wear. Together the shirts are very versatile and have kept me comfortable in a variety of temperature ranges and weather conditions. Other than some slight pilling on the sleeves of the Skin200, no signs of wear are noticeable yet, and I expect to get several years of use out of both of these tops. I find I've become a real fan of Icebreaker baselayers, and hope to add a pair of long base layer pants and a pair of briefs to my Icebreaker collection in the near future. Since my top layer clothing comes back from a trip nearly stench free now, it would be nice to have the bottom layer do the same. This concludes my Long Term Report on the Skin200 and Bodyfit260 tops from Icebreaker. Thanks to Icebreaker and BackpackGearTest for the opportunity to test these marvelous tops.